We’d love your help. Let us know what’s wrong with this preview of Timeless by Jan Scarbrough. When Beth Abbott receives a surprise inheritance from her birth mother, she travels to the family’s nineteenth century mansion in Old Louisville, now a bed and breakfast. There she meets the resident ghost, a little girl whose crying scares, but intrigues guests. Beth sets out to discover the identity of the ghost and why she appears happy to Beth, not sad. Jeff Halstead, a When Beth Abbott receives a surprise inheritance from her birth mother, she travels to the family’s nineteenth century mansion in Old Louisville, now a bed and breakfast. There she meets the resident ghost, a little girl whose crying scares, but intrigues guests. Beth sets out to discover the identity of the ghost and why she appears happy to Beth, not sad. To ask other readers questions about Timeless, please sign up. Click on Banner to Enter Starts Jan 6th! They say things happen for a reason, when they are supposed to happen. Is that fate? Something else? Timeless by Jan Scarbrough is a story of acceptance, inner growth and the connection of love. Beth knew she was adopted, knew she was loved, times were tough for her and her mother, both emotionally and financially. When a man claiming to be the attorney for the estate of Beth’s recently deceased birth mother shows up saying she will inherit her wealthy mother’s estate, things appear to be looking brighter, but as with all things that seem too good to be true, there is a catch. A very big catch. What Beth never expected when she moved into the historical Bed & Breakfast she had inherited was that she would feel a connection to the older man running the home. She certainly never expected to meet the resident ghost, a young girl from long ago, trapped and unable to move on. Was the young child harmless? Did she have unfinished business to attend to? What was she to Beth? Was she the cause of Beth’s nightmares and dreams of people she had never known? Jeff Halstead has his own secrets, but even he cannot explain the magnetic pull he feels to Beth. Is the young girl from long ago the key to unraveling past lives and past truths that have lived on in the hearts and souls of Beth and Jeff? Is she condemned to an existence without eternal rest?? Far from dark and scary, Jan Scarbrough’s Timeless is an wonderfully enchanting read that blends history with the present in a beautifully structured manner that flows through each page. The world she has created is detailed in its backgrounds and filled with dialogue that feels natural while keeping a veil of mystery throughout. Well done with a mellow pace and perfectly pitched high points! A touching story of a connection between two people that has survived through the centuries. And a ghost that many people have seen - but why does she cry for some and is happy when she appears to another? This was such a quick lovely heart warming read. I love books that make me think about life, and what our purpose actually is in this world, and this story was one of those books. I don't really want to go too much into the story line, as I want the book to be a surprise, although there are hints in the synopsis, I don't want to spoil all the fun!!! Beth the main female character is a bit of a misfit. Given up by her birth mother and adopted into a family, she has always felt like a bit of an outsider. She has never felt like she fitted in anywhere, never had any really close friends and her adopted mother often referred to her as an 'old soul'. Beth and her mother have struggled through life financially, and ever more of late as Beth's mother recently had cancer, which put Beth in the position of being the number one bread winner as well as carer for her mother. So when she is approached by her birth mothers lawyer and told that she has inherited over 2 million dollars and all she has to do is live in her birth families mansion-turned B&B, Beth and her mother Sue think that all their dreams have been answered. Sue encourages Beth to go and discover who she is, so Beth packs up her life and moves across the country to her new home. Jeff, who is Beth's birth mothers nephew has been running the B&B for the last number of years, and is also a man of mystery, we don't really discover much about Jeff's life other than he was in finance until 9/11 when he was injured in the tower collapse. In hopes of escaping the memory of the event, as well as the memory of something that happened, he escapes to his aunts B&B and eventually begins running it. What we do know about Jeff is that he has an unusual skill, he can talk to ghosts. When he and Beth meet for the first time there is an instant attraction that they can not explain. Drawn to each other in unexplained ways Beth and Jeff begin an uneasy friendship and attempt to get to know each other, although something is always hovering between them that neither of them can explain. I really related to Beth, and was so enthralled with how she just took life by the balls and took what ever came her way and did not crawl into a hole. Jeff really had a bit of a journey of discovery for himself, and with Beth's love and support he lives up to his destiny. So as I said before if you want a nice easy heart warming story with a but of a supernatural twist, then give this a go!!!!
" His kisses rained down on my face, covering it with his passion. And then his lips found mine. I kissed him, and he returned my kiss as if we were long-lost lovers who has been seperated and were now reunited." " I watched him, hardly blinking, and drinking in his profile. The love I had for him poured through my soul, enlightened me with radiant energy that rippled through me. "Dear God, I love him." I whispered." Loved this book! From the beginning the story grabs you and keeps you entertained through to the last page. It is not a time travel romance as I thought it might have been. Do you ever meet someone or find yourself in a circumstance and you feel as if it was daja'vue. That is what is happening in this book. Beth Abbott has known she was adopted for as long as she can remember but she has always wished to meet her birth parents. She finds out it is too late, her Mother has a lawyer come to see he Loved this book! From the beginning the story grabs you and keeps you entertained through to the last page. It is not a time travel romance as I thought it might have been. Do you ever meet someone or find yourself in a circumstance and you feel as if it was daja'vue. That is what is happening in this book. Beth Abbott has known she was adopted for as long as she can remember but she has always wished to meet her birth parents. She finds out it is too late, her Mother has a lawyer come to see her to tell her she has inherited a large Bed and Breakfast, along with a large amount of money but that will be given out as an allowance until she is 35. If she wants to inherit the Bed and Breakfast she must drop everything and go and live there for a year, to learn about her family and to learn the business. She decides to do this for her Mom so she can send money to her Mom. The man who is the head cook and runs the place answers the door when she arrives and she feels as if she has known him from somewhere else. It takes a bit before she finds out he is clairvoyant, he can talk to spirits. He has never developed it though. Sparks fly between the two of them. The story tells of one tale in present time and one during the 1800's. They find out out the spirits, have been waiting for the two of them to find each other. I received this book in exchange for writing an honest review of it. I haven't read a book by Jan Scarbrough that I didn't like. When Beth Abbott receives a surprise inheritance from her birth mother, she travels to the family’s nineteenth century mansion in Old Louisville, now a bed and breakfast. There the new mistress of Chadwick House meets the resident ghost, a little girl whose crying not only scares, but also intrigues guests. As she sets out to discover the identity of the ghost and why the child ghost appears happy to Beth, not sad, Beth is confronted by evil from the past. Jan Scarbrough has crafted a unique story with an intriguing blend of the paranormal and gothic that brings two lost souls together after lifetimes apart. Though the story moves at a slow pace and has an overly obvious villain whose ending isn't near satisfying enough, I still found this a compelling read that brought the past into the present courtesy of a dead little girl with a heart of gold. Beth grew up knowing she was given away and felt resentment towards this unknown woman for being aband Jan Scarbrough has crafted a unique story with an intriguing blend of the paranormal and gothic that brings two lost souls together after lifetimes apart. Though the story moves at a slow pace and has an overly obvious villain whose ending isn't near satisfying enough, I still found this a compelling read that brought the past into the present courtesy of a dead little girl with a heart of gold. Beth grew up knowing she was given away and felt resentment towards this unknown woman for being abandoned. Life hasn't been easy as it's just her and her ailing birth mother struggling to make ends meet, until this unknown woman sends her lawyer with a life-altering opportunity. Beth has always feared taking chances but for the monetary help it will bring she agrees to go stay and learn the ropes of running a bed and breakfast. The moment she enters her new home she has visions from the past, makes a connection to a ghostly child, and finds the love of a lifetime. For such a young and seemingly naive girl these are big changes that she accepts easily. Very little ruffles her feathers which leads her more than once into dangerous situations with a charming but cruel young man who has a unique connection to her. Beth is ultimately likable and seeing her finally released from the unknown feelings of guilt that have always weighed on her is satisfying to see. There's more to Jeff than what there seems at first. Since 9/11 he's hidden away, working at the bed and breakfast and being a supportive presence to the former owner and now Beth. He's an older and wiser man who's seen terrible things that he's still dealing with. He's a quiet yet comforting soul who's also able to commune with spirits, though fear holds him back from using his ability to the fullest. Though he's constantly having to save Beth from her own poor choices he never becomes exasperated with her. He accepts her completely and it's their combined strength and love that finally puts the past to rest so they can make a future together. I received this book in exchange for my honest review. Thank you Itching for Books and Jan Scarbrough for the opportunity of reading Timeless. First, I would like to say the cover fits perfectly the story and I love it! Second, this is a great book that has the best ingredients: romance and mystery. For me it was an incredible read, the characters are well formed, the story flows well and the twists were incredible. This story made me think about life and what purpose we have while we live. What I received this book in exchange for my honest review. Thank you Itching for Books and Jan Scarbrough for the opportunity of reading Timeless. First, I would like to say the cover fits perfectly the story and I love it! Second, this is a great book that has the best ingredients: romance and mystery. For me it was an incredible read, the characters are well formed, the story flows well and the twists were incredible. This story made me think about life and what purpose we have while we live. What can we do to make it memorable? Anyway, enough rambling. Our main character is Beth Abbott who had a hard past and continues to have a hard life. She doesn’t seem to fit anywhere; she doesn’t have friends or family. She is an outsider and by the way her adoptive mother put it, she is an old soul. Beth was cared by another family, after her real mother gave her up. Life hasn’t been easy on her. Now, she finds out her adoptive mother has cancer, and they always struggled with money. A silver lining comes to them, Beth it’s approached by some lawyers and she finds out she inherited a fortune after her real mother died. Everything seems to fall into place. But, in order for her to use the money, she has to move in the mansion. After some thinking, she decides to go and see what all the fuss is about and maybe find something about her mother. When she arrives at the B&B she meets her birth mothers nephew Jeff, who has been running the place. The connection between these two it’s instantly. Jeff is an unusual man. He cares about the B&B, he loves his job and he is starting to fall in love with Beth, but the strange part is he can talk to ghosts. I think I gave enough spoilers. This book deserves to be read. It was an amazing story. I connected with Beth instantly, she is a loveable person, always fighting for her future and for the ones she loves. The little supernatural twist really did the trick, to say so. It was perfect! I highly recommend this book, especially to those who can appreciate a great story! Timeless by Jan Scarbrough is part mystery, part romance and 100% well worth the read. Beth is a hard working waitress and part time student doing her best to help her mother who is recovering from breast cancer. At the very beginning of the book we find out that her parents are divorced, that she is adopted, that her north mother recently passed away and left beth a historical Bed & Breakfast and a trust fund in her will. There are stipulations in the will, however, that require her presence Timeless by Jan Scarbrough is part mystery, part romance and 100% well worth the read. Beth is a hard working waitress and part time student doing her best to help her mother who is recovering from breast cancer. At the very beginning of the book we find out that her parents are divorced, that she is adopted, that her north mother recently passed away and left beth a historical Bed & Breakfast and a trust fund in her will. There are stipulations in the will, however, that require her presence at the B&B for a year. Her birth mother's nephew (by marriage, not blood) has been running the B&B since shortly after 9/11 and is someone Beth feels an immediate connection to upon arrival. She just can't quite place why she feels this way about him. Now let us add in a ghost child and historical flashback dreams and this book kept me wondering almost the entire time. I like that it was not predictable and it's a very different plot from anything I've read before. His kisses rained down on my face, covering it with his passion. And then his lips found mine. I kissed him, and he returned my kiss as if we were long-lost lovers who had been separated and were now reunited. I have never been a real big believer in reincarnation, but my husband believes in it, so I tend to listen to his stories of our past lives to humor him. The problem is that his stories often coincide with dreams I have had that he doesn’t even know about, so our relationship is much like that of Beth and Jeff, which is… you know… Kinda weird and awesome at the same time. This story was cute in more ways than one. Beth is a lovable heiress with a past for connecting with bad men – literally. Spli I have never been a real big believer in reincarnation, but my husband believes in it, so I tend to listen to his stories of our past lives to humor him. The problem is that his stories often coincide with dreams I have had that he doesn’t even know about, so our relationship is much like that of Beth and Jeff, which is… you know… Kinda weird and awesome at the same time. This story was cute in more ways than one. Beth is a lovable heiress with a past for connecting with bad men – literally. Split between present time events and flashback memories in the forms of dreams, we see both of Beth’s lives (future and past) and how the events in both time periods connect and match in more ways than one. I have never been a big fan of large age-gaps between couples, but when Beth and Jeff got together, I stopped seeing the age gap and discovered the truth in their relationship, which was sweet and steamy at the same time. It was easy to see them together in the end – once they both got over their inner hurdles and actually began to trust one another. I couldn't put"Timeless" by Jan Scarbrough down once I read the first page. Meet Beth Abbott who was adopted at birth and never knew who her birth mother was. At 26 she works as a waitress and goes to college nights. Beth lives in Bowling Green, with her ailing and divorced adopted Mom and she is mostly content with her life. Returning home from work to their small apartment one afternoon Beth is surprised to find a attorney, setting with her Mom. She is stunned when he informs her that her bir I couldn't put"Timeless" by Jan Scarbrough down once I read the first page. Meet Beth Abbott who was adopted at birth and never knew who her birth mother was. At 26 she works as a waitress and goes to college nights. Beth lives in Bowling Green, with her ailing and divorced adopted Mom and she is mostly content with her life. Returning home from work to their small apartment one afternoon Beth is surprised to find a attorney, setting with her Mom. She is stunned when he informs her that her birth mother has died and left her a two million dollar estate. And she must immediately relocate to Louisville, Kentucky and spend the next year living in the Victorian mansion which is now a bed and breakfast to receive her inheritance. Her mom tells her she must go and shortly after Beth arrives at the beautiful antique fill mansion. From the moment she arrives, when the door is opened by the handsome manager that she is immediately drawn to, strange things begin to happen. There is the little girl ghost who laughs just for Beth and Jeff who she feels she has know before. Her dreams take her to a past a long time ago and the past and present must mesh to solve the death of the child. Disclaimer: I received this book for free in exchange for an honest review. This does not affect my opinion of the book or the content of my review. This is one of those books that, while I did enjoy reading it, I felt was missing something. And that something, in this instance, was length. We jump right in to the plot feet first, which in some ways, yay plot! But in others…I just didn’t feel like we knew our main character, Beth, well enough to sympathise with her when everything started happen Disclaimer: I received this book for free in exchange for an honest review. This does not affect my opinion of the book or the content of my review. This is one of those books that, while I did enjoy reading it, I felt was missing something. And that something, in this instance, was length. We jump right in to the plot feet first, which in some ways, yay plot! But in others…I just didn’t feel like we knew our main character, Beth, well enough to sympathise with her when everything started happening all at once. The plot itself had great promise, I really liked it, and in particular finding out more about the little girl who haunts the Bed & Breakfast – Grace. The flashback dreams Beth kept having were good, I think they were my favourite part because it fleshed out the history of the place and the reasons for the haunting. I just wish the present day situation with Beth and Jeff had felt the same. Reading Timeless, I was reminded of the old Barbara Michael’s novels. Gothic mansion. Young, plucky heroine. A ghost story to unravel before disaster strikes. And of course, a dour, handsome caretaker thrown into the mix. I miss curling up with those old stories, so it was a treat to immerse myself in this one. But this is the 21st century, so the sexual heat quotient here is a good bit warmer. The story hooked me from page one. The characters were entertaining, the scene setting delicious. It’s a well-plotted page-turner, with a satisfying conclusion I won’t spoil. 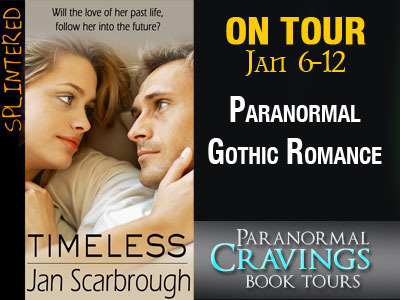 I thoroughly enjoyed Timeless by Jan Scarbrough. This isn't simply a romance of boy meets girl and falls in love. It is so much more! This touching story embraces the metaphysical world and delves into reincarnation and past lives without making it feel like fantasy. On top of this we have the mystery of a resident ghost, Grace, who will make you smile, cry, break your heart and mend it all at once. As if this isn't enough, we also experience several emotions as Beth discovers and adapts to seve I thoroughly enjoyed Timeless by Jan Scarbrough. This isn't simply a romance of boy meets girl and falls in love. It is so much more! This touching story embraces the metaphysical world and delves into reincarnation and past lives without making it feel like fantasy. On top of this we have the mystery of a resident ghost, Grace, who will make you smile, cry, break your heart and mend it all at once. As if this isn't enough, we also experience several emotions as Beth discovers and adapts to several changes to her life. Everything melds together to bring us a well developed cast of characters that will capture the reader's emotions. I’m a mystery guy. Timeless is my first romance and I loved it, probably because it’s not just a romance—it’s also a bit of a mystery. Jan Scarbrough builds tension and keeps you guessing with flashbacks to a 19th century Louisville mansion, danger, suspense, and—of course, romance. An interesting cast of characters, including a ghost, make this a fun read. Timeless is a well-written, well-crafted story that I highly recommend. First, I would like to thank the author Jan Scarbrough for giving me this book for an honest review. I enjoyed the story, it is a paranormal - gothic Romance. The characters are well developed and I liked the mystery of the story. Jan Scarbrough is quite good at her craft, I look forward to reading more of her work. I love ghost stories and romance. I only gave this a 3 star rating because I guess there wasn't enough "ghost" in it. I did like the characters and there is nothing more romantic than love that transcends time. I would recommend this book to a romantic minded person and anyone who loves the south. ✳✳ Visit our stop on I ♥ Bookie Nookie Reviews on January 10, 2013. I honestly could not put it down when i started it. It took me about 5 hours to read. It had me hooked. A technical writer by day, Jan Scarbrough spends her nights writing romance. She is a member of Novelist, Inc. Jan has written for Kensington and ImaJinn Books, and currently has contracts with Turquoise Morning Press and Resplendence Publishing. She lives in Louisville, Kentucky, and rides American Saddlebred horses for fun and recreation.